Police are appealing for information and witnesses after the body of a teenager was found in the River Brent in Greenford on Sunday. The body is that of seventeen year old Anton Hyman (pictured right) of Joseph Avenue, Acton. He suffered multiple stab wounds and a gunshot wound to the back. Police are treating his death as murder. A member of the public was walking alongside the River Brent near High Lane, Greenford, when they saw what appeared to be a body lying face down in the water. Police and London Ambulance Service attended the scene. The Marine Support Unit attended and the body was recovered from the river. Anton was last seen at about 8.00pm on Saturday outside KFC Restaurant in Ealing Broadway where police believe he got into a minicab on his own. Anton was black, five feet six-and-a-half inches tall and of slim build. When his body was found, he was wearing distinctive bright multi-coloured wooly gloves, blue and white Timberland boots, dark coloured jeans, a dark grey fleece, a green tee shirt and a green shirt with 'Iceberg' written on the breast pocket. 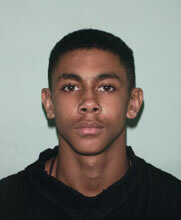 Although Anton had a record for minor offences, police say they do not believe he was involved in serious crime. His neighbours described him as being quiet and polite. The murder investigation is being led by DCI Colin Sutton of the Serious Crime Directorate, based at Barnes. Anyone with information, who knew Anton, who saw him after he got into the taxi on Saturday evening or the taxi driver who picked him up is asked to call the incident room on 020 8247 7911 or to remain anonymous, Crimestoppers on 0800 555 111.